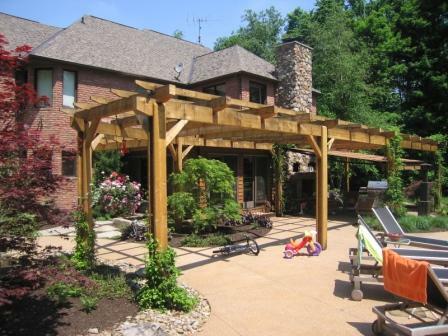 This pergola is the one I discussed in the most visited post on the site. There seems to be a lot of interest in pergola’s out there. Maybe the interest is in trying to figure out what a pergola is. For the overall goal of this project the main goal was to create several usable spaces. Especially where adults could gather away from the congestion of the pool area. A usable structure to house pool stuff, a hot-tub hidden away, shade area’s, and a way to connect it all together were the other request. The fireplace(pizza oven included) was built last and has become the most popular area. A awning was added to extend the use of this area later into the season. I’ve been told they even use the space with snow on the ground. I have been asked to add a structure that will house a fire wood storage, kitchen set-up, shower and toilet. This will be designed-in at the far right of the top photo. These features had been discussed initially but it wasn’t felt they were needed at the time. The stone that you see on the fireplace will be the same used on the building-to carry that theme over into the new construction. I am working on this project right now and will post images of drawings for this design. If you are a homeowmer who is looking at this site I strongly suggest at how you will use your pool space long-term. There has been a significant change in the way folks now look at their backyard. If you are spending the money for a good indoor pool, large entertaining space, hot-tub/spa, kitchen area’s . . . consider adding the the shower/change/toilet structure to your plans(budget allowing). I encourage Designer’s to add these elements in to any conceptual designs, it is easier to cut back . . . than to have to add on later. We all know about staging also . . . so design them in prepare for the future of the space. Color rendering, a look from inside. Conceptual rendering for a large pergola. Finally . . . a pergola for a walkway. I really like the proportions of your pergola and especially appreciate the design and structural detail of dado’ing in the first cross layer of the 4×6 rafters. I much prefer to see this dadoed detail rather than the all to common rafter plunked directly on top of the cross beam without any recess. Was there any particular reason why you left the wood unstained ? Or if it is stained / sealed why you chose this particular color ? Looks great and it sounds like the homeowner is getting a lot out of their investment. The winters here have convinced almost everyone to let the wood go ‘natural’. Sometimes I agree, sometimes I disagree. I had no strong opinion either way, the homeowner liked the ‘going gray’, contractor had no strong opinion-so gray we go. They are getting their money’s worth, this is a backyard truly ‘lived in’. Coming from (very near) the place where Crab Orchard stone originates, I have a fantasy (I haven’t even dreamed of a swimming pool) of a patio of said stone, with some natural shade (I have dogwood and cherry) and some pergola, perhaps with lush (when it’s not frost-bitten, like this year) clematis, or even better, the wisteria that will bloom wildly in the spring. Thanks for your ever-inspiring pictures — they give me hope! There seem to be a lot of what I call “lumber-yard pergolas” out there. Do you find that people appreciate the lumber-yard look? Have you designed any wooden pergolas that cannot be constructed from lumber yard wood? Do standard lumber sizes limit the design of pergolas? What about timber framed pergolas? What are your thoughts? 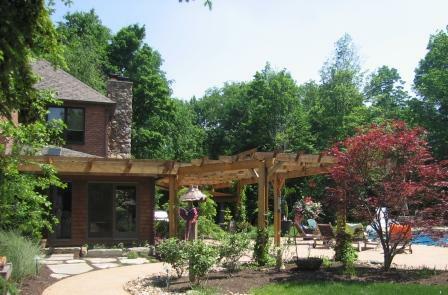 What thoughts do your clients have regarding lumber-yard vs. timber-frame pergolas? This is strictly a cost issue as I deal with it. What I am seeing is more folks ask for structure(s), on the higher end. **Have you designed any wooden pergolas that cannot be constructed from lumber yard wood? I think most pergolas i’ve designed can be worked with that type of lumber, especially if budget is a consideration. I have designed a few pieces with true 2″ or 3″ inch as opposed to dimensional lumber. ** Do standard lumber sizes limit the design of pergolas? No there are ways to work around if needed, especially with a good carpenter. ** What about timber framed pergolas? No client has ever asked specifically for such a thing, or anything with any special type of joinery. Pergolas, arbors, any treillage fencing, points of focus are ‘hot’ right now – as we have MADE them that way. In our area, we have laboured for 36 years to change people’s way of viewing landscaping. We, right or wrong, do NOT give people a lot of options when we are designing. I listen carefully, then interpret MY way. Cutting corners is NOT acceptable. I, too, like the da-doed timbers on the pergola. Was discussing a previously built structure with a good friend in Columbus (CENTS lunch time). Told him I loved the design, the end result, but I would always da-doe the timbers. Looks much more professional, looks custome and – might as well say it – if it looks that way, you can charge more. Just know what you ae doing – don’t ‘cabbage’ it together. We are still using a lot of rough-sawn WesternRedCedar, as we can acquire quality A & B materials. Lost the majority of redwood years ago, now seeing WRC slipping in availability and quality. I seems we will all move to the sustainable/recycable amterial at some point, though the WRC makes quite the statement. The high-end clientele not only like structure, but we are at the point that it’s expected in the design-which is cool with me. I also think that some sort of scribe/fussiness/da-doe brings unique character to the pergola, after all it’s the small details . . . the small details. Hi – I’m building a Pergola on my house in Serre Chevalier in France at the moment. I like your photos, but above all, I was really impressed with you using a blog platform as your site. I’m a real WordPress fan (and so are search engines). If you’d like to know more about different ways to ‘Get #1 in Google’ have a look at my site. Meanwhile I’ll sort a blog on the evolution of my Pergola. Your pergola looks great and makes the garden look very attractive. Pergolas, arches and arbours are all very popular in the UK. I bought a pergola in the summer from a UK based garden fencing company. I would recommend getting a pergola to everyone as it’s made my garden look so much better and more interesting. Everyone that comes to my house comments on how great my garden looks. I am trying to get a feel of the bulk of the Pergula… what was the size of the Beams and Rafters? It looks like the post skins are 2×10. thank you from Anchorage AK.